Roseman's work earned him great respect from the clowns, and his modesty and pleasant manner established lasting friendships in the closed and itinerant circus community. Madison Square Garden, New York City, 1977.
to finally see the portrait. We are thrilled to have the painting in our collection." "Circus clowns are one of the glittering joys of all of our lives, whether we are young or old. Through their theatrical exaggerations, their madcap gestures and antics, their rubber acrobatics and their mimes, they create a magic world at once filled with captivating innocence as well as with the essence of which life is made. They can reach through our pretensions and postures, bare our masquerades through theirs and, all told, touch our souls. Enamored of the circus and the clowns from his childhood, Roseman enthusiastically returned to the circus in his professional career with a cordial invitation from the Ringling Bros. and Barnum & Bailey Circus. What began with a series of drawings of the celebrated clowns for three exciting weeks at Madison Square Garden, New York City, in the spring of 1973, became a major theme in Roseman's oeuvre and a critically acclaimed work on the subject of the clown. The Musée des Beaux-Arts, Bordeaux, conserves in its prestigious collection the superb portrait Frosty Little, 1977, (fig. 2). Roseman depicts the esteemed Director of Clowns in a quiet interlude between the busy backstage activity of preparing for a show and the heightened energy of a performance in the arena. A warm harmony of yellow ochre, orange, lilac, and sienna pervades the painting. 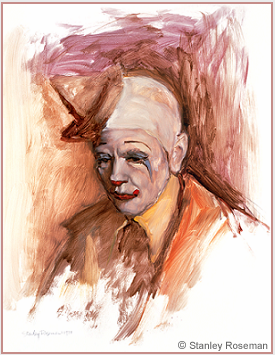 Roseman's fluent brushstrokes defining the pictorial space and describing the circus clown's costume are complemented by the fine modeling of the facial features and the subtle tones of the clown's white-face makeup. The pyramidal composition of the painting is restated in the triangular leitmotif of the boat-like hat on the clown's "bald" head, the shapes of his collar and jacket, and the light-blue makeup that descends from the corner of his eyes onto his cheeks. The red on his lower lip and on the tip of his nose add bright accents to the beautiful painting. In its review The New York Times observes the humanism in Roseman's depictions of the circus clown, who "has chosen his profession and carries it out not only with artistry but with a shiny dignity. . . . But he is also described in those moments of introspection. . . ."
The Ringling Bros. and Barnum & Bailey Circus, also known as ''The Greatest Show on Earth,'' traveled annually in those days on its own lengthy circus train and performed in three rings in amphitheaters throughout the United States. The Director of Clowns, Glen ''Frosty'' Little, corresponded with his new friend in the months following the circus' spring engagement in New York City. 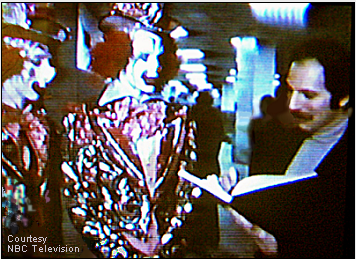 Encouraged by the clowns to join them on the road and to bring his painting materials, Roseman traveled in October of 1973 to Chicago, where the famous American circus played the Chicago Amphitheater. 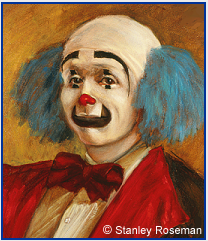 In a rare acceptance of a circus outsider, Roseman was given the unique privilege to draw and to paint portraits of the clowns in the private backstage area appropriated for the clowns' dressing room, called in circus terminology ''Clown Alley,'' a legendary place within the circus world. The Director of Clowns provided Roseman with his own place to set up his easel and canvases in Clown Alley, the first of such working spaces he was given in his sojourns with the circus over the years. The clowns offered Roseman their time in the intervals between their acts, during intermissions, and before and after the shows. Tommy Adams, whose friendly personality delighted circus audiences, was the first to model for the artist in Clown Alley. The young clown, wearing a red plaid shirt, brown hat, and beige trousers, stands with a pensive expression under his white-face makeup with a painted red smile in the superb oil on canvas portrait Tommy Adams, 1973, (Private collection, Michigan). The auguste clown and dwarf Jimmy Briscoe augmented his small stature by his commanding presence in the circus ring. Jimmy, with red nose and painted freckles on his rouged cheeks, is costumed in a colorfully patched, turquoise suit and green top hat as he looks out from the canvas in Roseman's very fine portrait Jimmy Briscoe, 1973, (Private collection, Switzerland). "The clowns of the Garden have invited Stan into their backstage lives as a friend. He has joined the circus family." 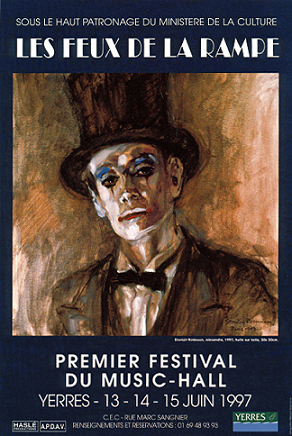 The NBC broadcast included an interview with Roseman in the Main Gallery of the Lincoln Center Museum, where were exhibited a hundred works on paper and the artist's life-size paintings of the circus clowns. Sojourning with the Circus in 1973 at the Nassau Coliseum, Long Island, Roseman painted the portrait of Keith, (top of the page), and an equally impressive portrait of master clown Bobby Kay, whose distinctive white-face makeup is complemented by a voluminous ruff, (Private collection, Switzerland). The auguste clown Mark, wearing a Harlequinesque costume, and his partner the white-face clown Ron, in striped shirt and blue trousers, appear together in a wonderful painting, (Private collection, England). The tall, elegant clown known as King Richard was a regal subject for the artist's brush in a beautiful painting, (Private collection, New Jersey), and again in 1977 at the Nassau Coliseum, where the artist also painted the portrait of Frosty Little, (fig. 2, above). In Washington, D.C., and Troy, New York, in 1976, Roseman created impressive paintings of Bruce and Dale, who are seen with the artist in the photograph above, (fig. 3), from the NBC Television News broadcast. The Victoria and Albert Museum, London, conserves the splendid portrait George, presented here, (fig. 4). George is costumed in white like the commedia dell'arte character Gilles, who is depicted in paintings by Watteau, or a modern-day Pierrot with bright orange hair under a white hat and wearing a large purple bow tie. With fine chiaroscuro modeling Roseman renders the expressive face of the clown. The warm tones of a pearly-gray background are applied with a freedom of brushwork. The portrait George joins the museum's renowned collection devoted to the performing arts. 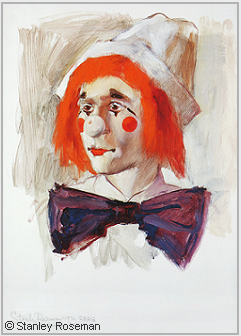 At Philadelphia's Spectrum amphitheater in 1977, Roseman did an engaging portrait of the white-face clown Chino with red nose and orange hair, (Private collection, New York City), as well as a suite of fine, pencil drawings of the clowns in performance and in Clown Alley. That same year Roseman resumed painting and drawing the clowns in the familiar backstage environment of Madison Square Garden. Taking up his sculpting tools and clay, Roseman sculpted in 1978 a life-size bust of King Richard wearing a high top hat and Elizabethan ruff. In a reportage on Roseman's work on the circus clown, Anzeiger von Saanen, Gstaad, praises the ''superb portrait sculpture in bronze of King Richard.'' The edition of the sculpture King Richard comprises eight signed and numbered bronzes (Private collections, United States and Switzerland). 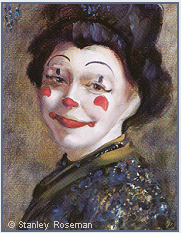 The white-face clowns of the Ringling Bros. and Barnum & Bailey Circus have a tradition of designing distinctive clown makeup, as seen in Roseman's portraits and exemplified here by the portrait Ruth. Ruth's beautiful makeup enhances her oval face. Red crescents adorn her cheeks, and thin, arched eyebrows are drawn high on her forehead. The corners of her eyes are accented with curved, black lines. Ruth applied small, red circles to the corners of her mouth and outlined the red on her lower lip with a thin, black line, as she did to the red on the tip of her nose and the crescents on her cheeks. In this splendid portrait, Roseman's fluent brushwork and stipples of blues, silvery-whites, and gold describe Ruth's costume complemented by the artist's fine chiaroscuro modeling of the clown's lovely face in powdery-white makeup. Ruth turns to look out from the canvas and smiles sweetly at the viewer, as she did for the artist painting her portrait. Although the male clown has traditionally held a prominent place in the circus ring, two young women Peggy Williams and Ruth Chaddock joined the Ringling Bros. and Barnum & Bailey Circus in the 1970's and revived the personage of the female circus clown. A head-and-shoulders portrait of Peggy Williams wearing a fin-de-siècle hat and feathered boa around her shoulders is included in Roseman's ''stunning series of engravings entitled 'Clowns,' '' as states The Times, London. Ruth Chaddock is the subject of the oil on canvas portrait presented below, (fig. 5). Talented and charming performers, Peggy and Ruth were captivating models for Roseman, as the Parisian clownesse Cha-U-Kao had been for Toulouse-Lautrec a century before. When The Performing Arts in America exhibition was at the Library and Museum for the Performing Arts at Lincoln Center, Roseman received an invitation from the executive administration of the Engineering Research Center of Western Electric, a division of American Telephone and Telegraph (AT&T) in Princeton, New Jersey, to mount an exhibition in the Corporate Education Center's galleries at its campus in the neighboring town of Hopewell. Roseman was appreciative of the invitation as he had earned his Bachelor of Fine Arts degree from the Cooper Union for the Advancement of Science and Art, the prestigious New York City college that combines the three disciplines of art, architecture, and engineering in a single institution of higher learning. Featured in The New York Times review is the magnificent portrait of the young circus clown Keith Crary, (fig. 6). The clown in beautiful, white-face makeup, with a broad, black, painted smile; small, red nose; and ample tufts of blue hair on the sides of his head, is fashionably attired in a white shirt, dark jacket with red lapels, and a burgundy bow tie. With complementary warm shadows and brilliant white highlights, Roseman has masterly rendered the face of the young clown who with sympathetic eyes offers the viewer a friendly regard. The Spirit of the Clown inspired Roseman again when he took up his oil paints and paper and chalks in Paris, where troupes of Italian players of the commedia dell'arte first performed in the sixteenth century at the invitation of Catherine de Médicis, an enthusiastic patron of court divertissements and the new form of dance that came to be called "ballet.'' Over the following centuries, the comic characters of Harlequino, Pedrolino, Giglio, and Pulcinella assimilated into the French theatrical tradition. The Clown earned a respected place on the stage, in the circus ring, and in the music hall and became an important subject in French literature and art. The catalogue Les Arts du Théâtre de Watteau à Fragonard, Musée des Beaux-Arts, Bordeaux, states that the art of the eighteenth century in France is "strongly identified with the world of the theatre," ("profondément marqués par l'univers du théâtre"). Through the nineteenth and twentieth centuries, the Clown appears in works by Daumier, Doré, Courbet, Degas, Manet, Toulouse-Lautrec, Renoir, Cézanne, Seurat, Bakst, Léger, Rouault, Matisse, Picasso, and Chagall. Roseman's captivating models in their greasepaint makeup and fanciful costumes include youthful comic performers garnishing early recognition and celebrated clowns of the day. ''Resuming a thematic work from his youth, Stanley Roseman is again absorbed with the subject of the clown. For the oil on canvas portrait for the poster, (fig. 7), Roseman chose as his model a young, French performer named Alexandre and clothed him in semi-formal attire, with top hat and black bow tie, as the pictorial Master of Ceremonies. With the artist's knowledge of the traditional types of clowns and having observed the application of clown makeup from his celebrated models at the Ringling Bros. and Barnum & Bailey Circus, Roseman designed a distinctive, white-face makeup for Alexandre. With brown eyes, accented by black eyeliner and complemented by blue eye shadow, Alexandre looks directly out from the canvas. Alexandre transcends the painting's initial purpose to announce such a festive event as the First International Music Hall Festival. The dramatic stage lighting and the artist's chiaroscuro modeling of Alexandre's face, with strong lights and shadows, emphasize the young man's lean visage under his worn top hat. The smokey brown tones of the background contribute to a feeling of pathos in this magnificent portrait. Under the High Patronage of the French Ministry of Culture, Roseman was commissioned to create a work for the poster announcing the First International Music Hall Festival, Les Feux de la Rampe (Footlights), 1997. 7. Poster for the First International Music Hall Festival Les Feux de la Rampe (Footlights), 1997. Presented under the High Patronage of the French Ministry of Culture. Roseman's work on the subject of the Clown is also presented on the website stanleyrosemandance.com. Along with paintings from the artist's sojourns with the Ringling Bros. and Barnum and Bailey Circus is a selection from the suite of drypoint engravings Clowns, published by Ronald Davis 1976, and conserved in the Bibliothèque Nationale de France, Paris; Victoria and Albert Museum, London; and the Library and Museum for the Performing Arts, Lincoln Center, New York City. "Spirit of the Clown Paris'' presents the artist's paintings and drawings that include works in the Musée des Beaux-Arts, Bordeaux; Palais des Beaux-Arts, Lille; Museum Ingres, Montauban; Musée d'Art Moderne et Contemporain, Strasbourg; and the Teylers Museum in the Netherlands. 8. Stanley Roseman drawing from a loge in the landmark Le Théâtre le Ranelagh, Paris, 1995. Here is the link: http://www.stanleyrosemandance.com/clowns.html. 1. Pierre Louis Ducharte, The Italian Comedy, (New York: Dover Publications, 1966), p. 20. (Bordeaux: Musée des Beaux-Arts, 1980), p. 43. (text in French and English), (Paris: Bibliothèque Nationale de France, 1996), p. 11. 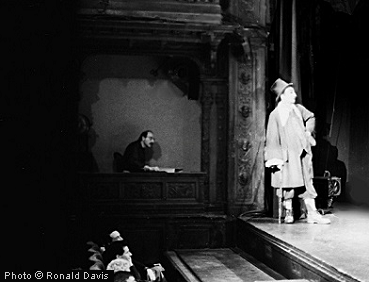 The Administration of the Ranelagh Theatre kindly provided Roseman with a loge on either side of the stage from where he drew the clowns at performances.